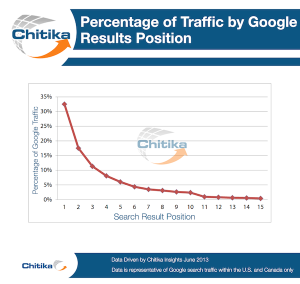 Home / Blog / content marketing / So How Much is the #1 Google Search Result Worth? 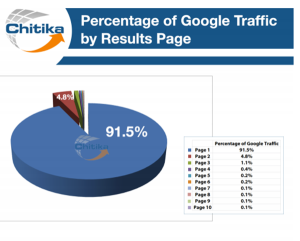 In case you did not view this data from Chitika, it clearly shows how important it is to be on the first page of Google’s search results. 9 out of 10 people (90%!!) are satisfied with that first page of Google’s search results and only 1 out of 10 decides to take a look at page #2. WOW! Let’s face it, this is tough news for for small companies that are fighting in very competitive markets to get a coveted spot on that first page. 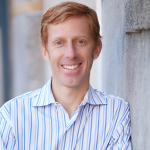 So what can companies do to compete in this hyper-competitive online search market? Today’s market is saturated with mobile devices and mobile searches are rapidly increasing. Last year there were 30 Billion mobile searches and 12 Billion of those were for local companies. Hence, companies today want to make sure that they have a strong local SEO strategy. Let’s face it, if you own say a small auto insurance insurance company in a city or perhaps in a suburban area, it will be very hard to compete against the national companies that can spend large sums to really own page #1. Small companies can use their location to their advantage. Make sure that you register your business with Google’s small business – https://www.google.com/business/placesforbusiness/ This is a great, easy and free way to boost your search rank and get you in the game. Just make sure that you enter the right info as a lot of businesses make silly errors here. Remember, customers want to find what they are looking for without any delays. Include your location in your Title Tags. Yes this is a big one! You might even want to almost brand yourself around your specific location. For example, if your business is located in Atlanta, Georgia, then you might want to use some marketing messages that highlight your time or loyalty to this town. Content Marketing Campaigns based around location. You might want to create marketing campaigns (on your site, blog, social media) that tout your affinity to your specific location and if your business has been in this location a while you will want to highlight this for credibility. Local Link Building. Obviously, make sure that you are listed in the local area listings, Yelp, Citysearch and Patch. You will also want to look at your local business community to see what is popular with other local businesses (eg. Chamber of Commerce, Networking Groups, Community Groups, etc.) **This is where small businesses really have a leg up on the national chains because let’s face it, when was the last time you left a review for a McDonald’s burger? But, on the other hand, most of us are much more willing to post reviews for the local restaurant around the corner. Guess what all those reviews help your site with? Yes, better search rank. Social Signals. Make sure your business has a Google+ page and an additional social channel (Facebook, LinkedIn, Twitter, etc.) Be sure to communicate via these channels, search for your audience and build quality content as well as relationships. The key in this arena is to be consistent with your communication and to let your personality shine (be bold, try new things and have fun). These five tactics should help you gain a solid standing in your local search results which is a wise as well as crafty way to compete against the big boys. Additionally, the more you can become a fabric of your community, the more your business will gain. Remember the days when local businesses sponsored a little league team? Today, you see more Loews and Home Depots on team jerseys, but there is plenty of room for a local dentist, pizza shop or auto insurer to sponsor a local team.